8.04% of people buy Play-Doh - Sparkle Compound Collection and Play-Doh Plus Colour Set 8-Pack. The pale yellow in this set had two holes punched in the lid and the product had started to harden. This must have been done at the production line as it was completely sealed in the packaging and you couldn't see the holes until it was unpacked. However all other colours were fine, therefore only 4 stars. These arent the tiny cans but not the larger ones either. These are the medium sizes ones. Glitter shines and 3yo loves it. Calls it her pretty playdoh! 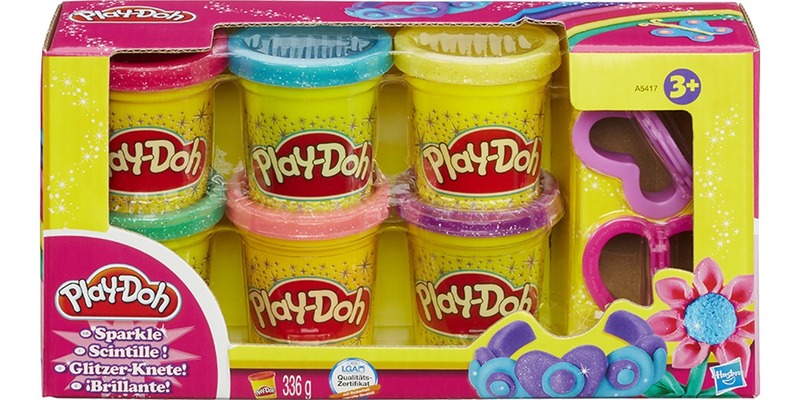 Would be awesome as a stocking stuffer for two kids who already have a good stock of playdoh. 3× cans plus a cutter each. Good value too.